So I said I wanted to write a little bit today about some baseball, and I thought I good thing for me to do until the season starts, and maybe afterwards too, is to write a little bit about some of the guys who have gotten autographs from over the years. I have been collecting autographs for over thirty years, and I have primarily baseball players in my collection, although I do have some others as well. I would have to say about 90% of what I have I obtained myself, mostly through writing letters to players and from meeting them at card shows, conventions and ballparks. The other 10% are autographs I have purchased over time, mainly players who I liked who for one reason or another I was never able to get (mainly because they were deceased, but others simply changed their signing philosophies over the years and don’t sign anymore). Anyway, over all this time I have amassed about 5,000 autographs or so. I still send out letters occasionally, though very infrequently over the last few years. I will say that even though times have changed and many more players and former players do not sign anymore, the majority of them still do, although some ask for a donation to a charity before they will sign anything. I have no problem with that and have given money to some players over the years for that reason. I have no problem with these guys trying to raise money or make money off of this since there are many people who are making much more money selling the stuff than the players get from it, particularly if the stuff they are selling is fake. Two things about me and my collecting. I never have any intention of selling all this stuff. I’ll leave that for Sean to decide on when I am long gone. Sure it takes up a lot of space (I have about 30 years worth of baseball cards too) but it makes me happy. Two, I am sure some of the signatures I have are fake, but it doesn’t bother me. I don’t collect them with the hope that they are worth anything since I don’t plan on selling them anyway. If someone gave me or sold me a fake, oh well, that’s the way it is. I collect them because I like to collect them. To me, it is a part of history and a sport I love to watch and each piece reminds me of something. 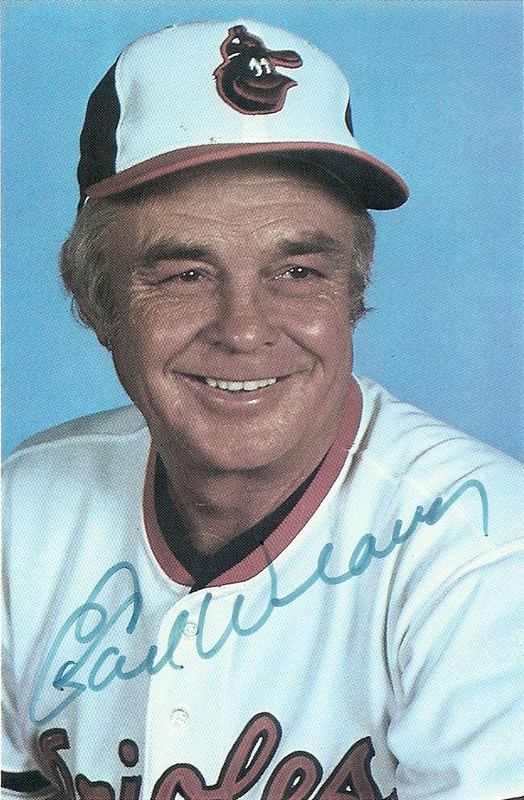 That being said, I had another in mind I was going to talk about today, but with the passing of Earl Weaver earlier today, I thought I would start with him. He was one of the first people in baseball who I got an autograph from. At the time, he was still the manager of the Orioles, so you know it was a long time ago. Earl Weaver was one of those people in baseball that you just had to like. He never played in the major leagues himself, although he was a ballplayer in the minors for the Cardinals, Pirates and Orioles before he got into managing. From what I have read, he wasn’t much of a hitter but was a decent fielder. Back at the time he was playing, in late forties and early fifties, small guys like him who were good fielders but didn’t hit well populated the majors and minors. He started managing with the Orioles organization in 1957 and was basically with them his whole life after that. he managed in the minor leagues until 1968, when the Orioles brought him up to be their first base coach and he took over as manager later that year. he managed great Baltimore teams and players like Brooks Robinson, Frank Robinson, Boog Powell, Jim Palmer, Eddie Murray and Cal Ripken, among others. He won over 1,400 games as a manager, led them to the World Series four times, winning once in 1970. The Orioles retired his number 4 and he was elected to the Hall of Fame in 1996. He was known for a few things throughout his career. he was legendary for his arguments with umpires and getting thrown out of games. If you are a baseball fan, you have no doubt seen clips of him kicking dirt on umpires, which he seemed to do with great frequency.He was also widely known for his “three run homer” philosophy toward the game. Weaver wasn’t much for the tactical part of the game where you use things like the stolen base, bunting or the bullpen very often. He expected great starting pitching and home runs to carry his teams, and for the most part they did when the Orioles were successful. I never met him personally, but he was nice enough to answer my fan letter all those years ago and I thank him for it. RIP Earl. Finish this sentence: For one day I wish I could hang out with . . .
To me it is a pretty wide open question, so approach it however you would wish. It could be someone who you see every day today, a family member from the past or present, someone famous, it doesn’t really matter who you pick. Choose someone who you think it would be fun to hang out with. You can leave your answer in the Comments here or on Facebook if you would like. I’ll ask some other people on Twitter too and see how they reply and I’ll give my answer in my next post. Okay, I need to go work on my fiction from yesterday. If you are playing along remember, the topic is a person covered with tattoos and a rest area. Sean and I have been shooting ideas back and forth to each other all day long, so hopefully he will come up with something too. As for today’s song of the day, it also turns out to be another legend, not of baseball, but of movies and music. That’s it for today. Check back next time to see my answer and whatever else I feel like writing about that day, and check back for the next piece of fiction too. Have a great day!